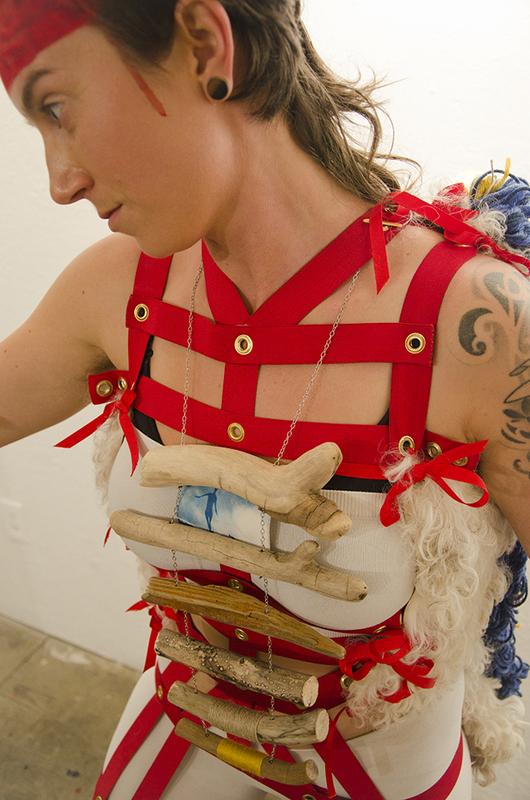 A set of 5 wearable sculptures and performance installation exhibited at the Durango Arts Center as part of a group contemporary art show. 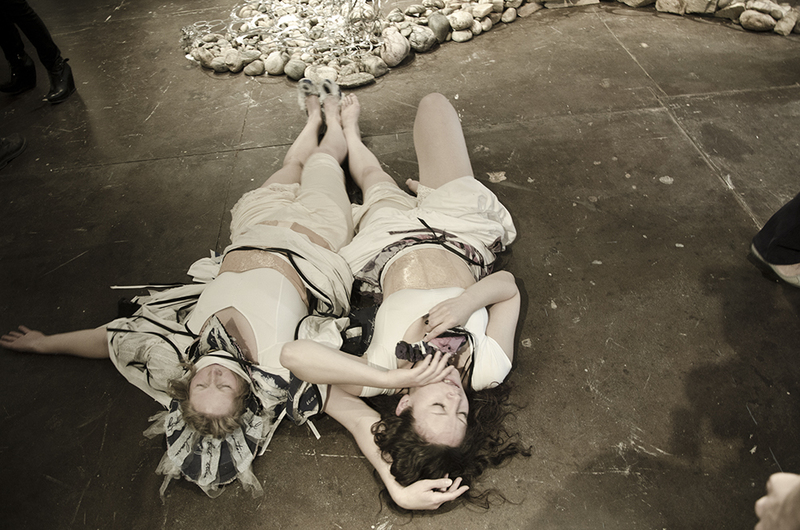 The performance installation explored the contrast between the internal and external experiences of being in a body, the distinction between primal self and personality. I have been very conscious of how we connect with one another. How simple and gritty being human, being in a body, truly is. How rare it is to attune with another human being and share an unfolding moment. 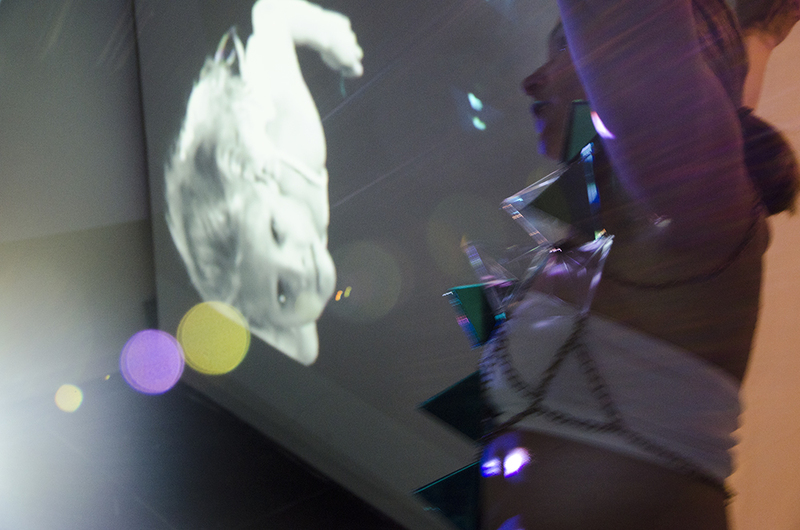 Additionally, with this work I explored the relationship between the performer and the audience, shifting the audience’s experience from “observer” to “witness”. 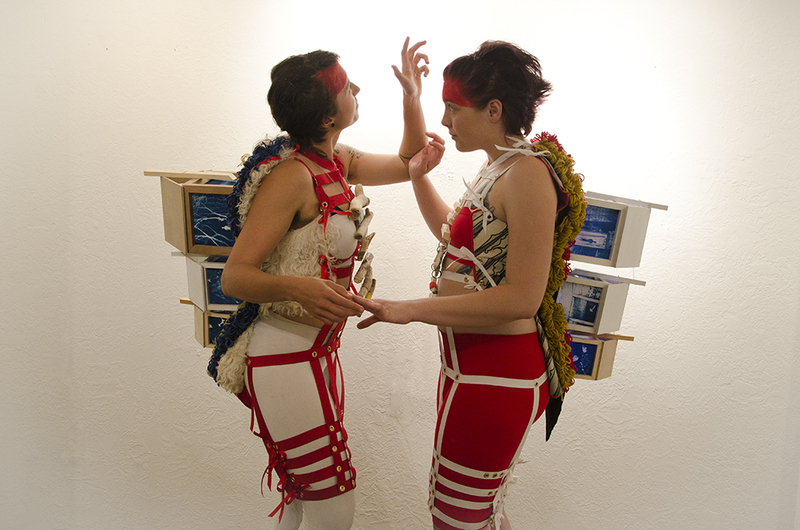 This performance installation demanded that the performer be completely present, and invited the audience to share in that experience. 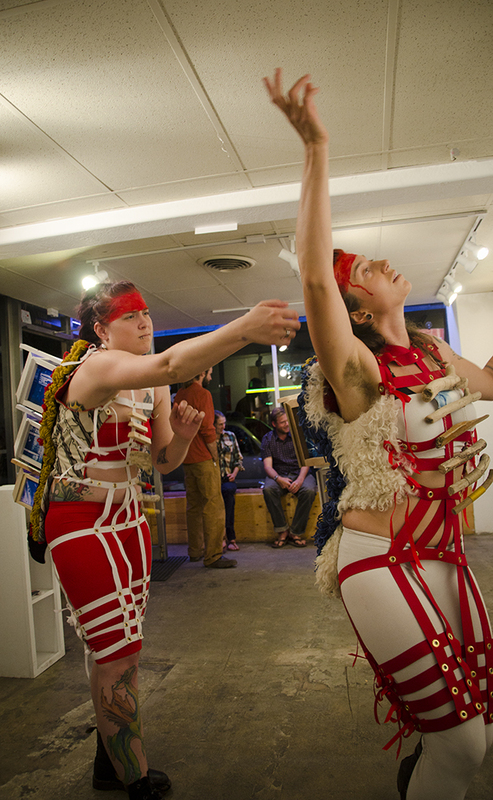 Internally, the performance artists wearing the textile pieces explore the visceral, primal state of being in a body. The weight of skin, organs and bones. The vulnerability of being raw and communing with another. 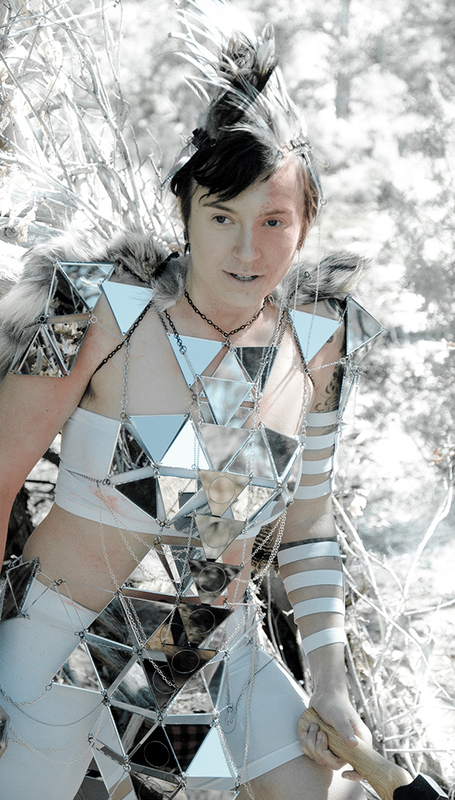 Externally, the performance artists wearing the plexiglass mirror pieces explore the experience of building a self or a personality. They play with mimicry, reflection and empathy. 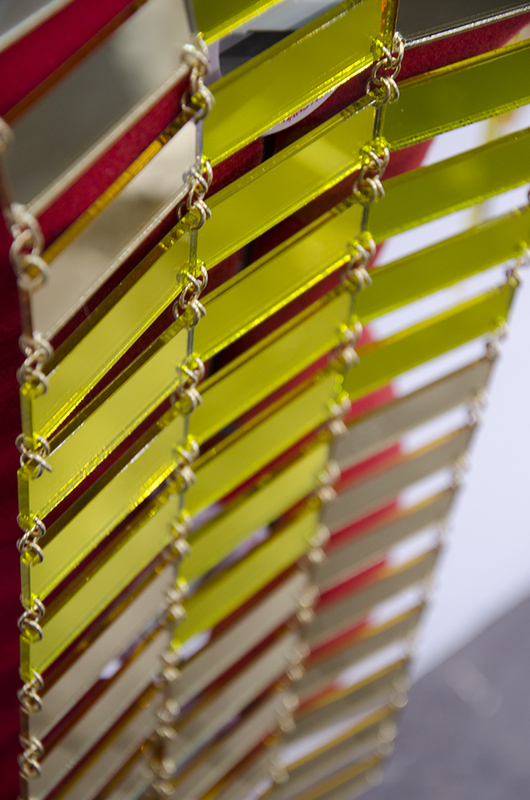 They investigate structure, form and repetition, finding themselves in one another. 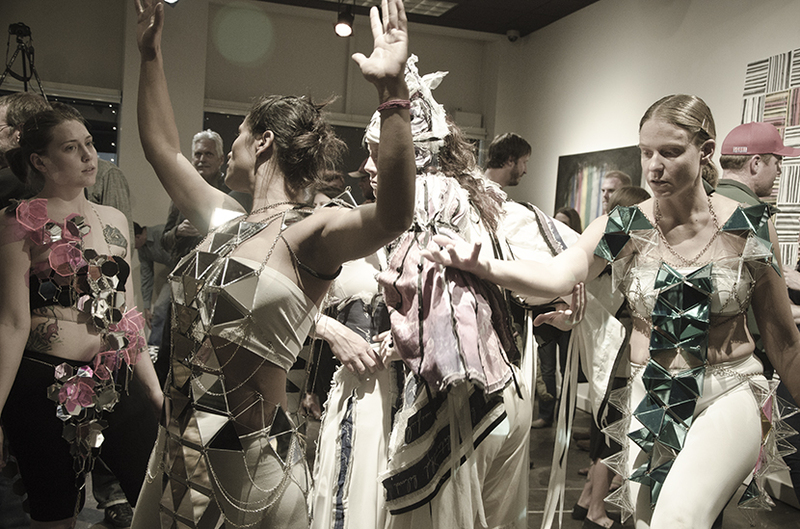 A set of six reversible wearable pieces made for the 20 Moons Live Music and Dance production Wearing Through, an original evening-length performance project with guest director Suzy DiSanto. The production wove together stories of the lives and deaths of the six wives of Henry VIII with the living/lived experience of 7 contemporary women, exploring the theme of survival in the context of a moment, a lifetime, the span of generations, human existence. 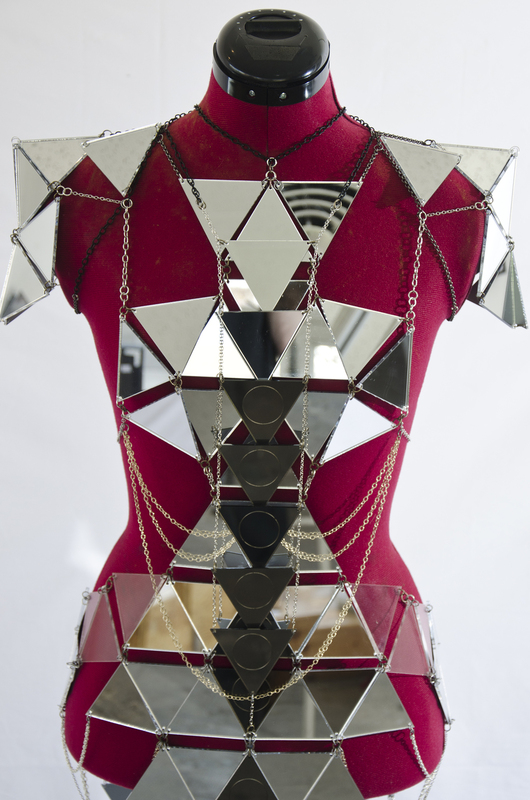 These pieces needed to be handled, worn, taken off and reversed on stage, in the midst of rigorous contemporary dance. I used hand drawn illustration, vector art and vintage images of anatomical diagrams and botanicals to print textiles and combined those with layers and textures in a variety of materials. 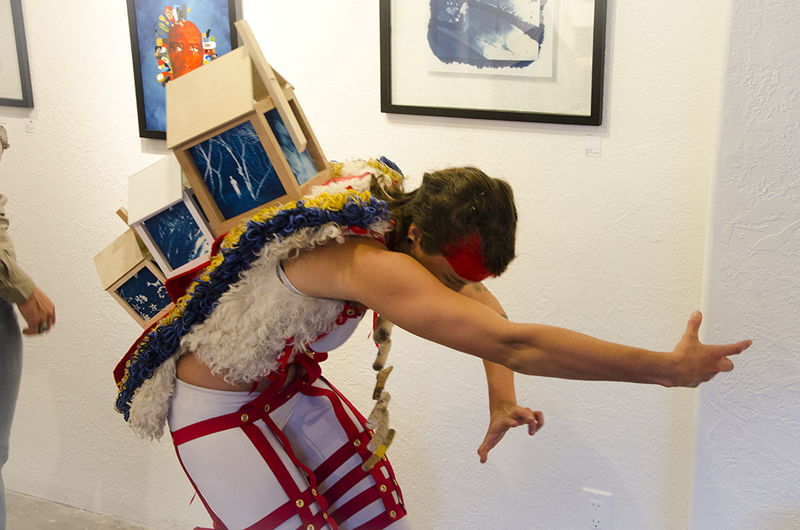 A set of two wearable sculptures and a performance installation presented as part of the opening reception for the solo show Haunt, Studio & Gallery, Durango, CO. 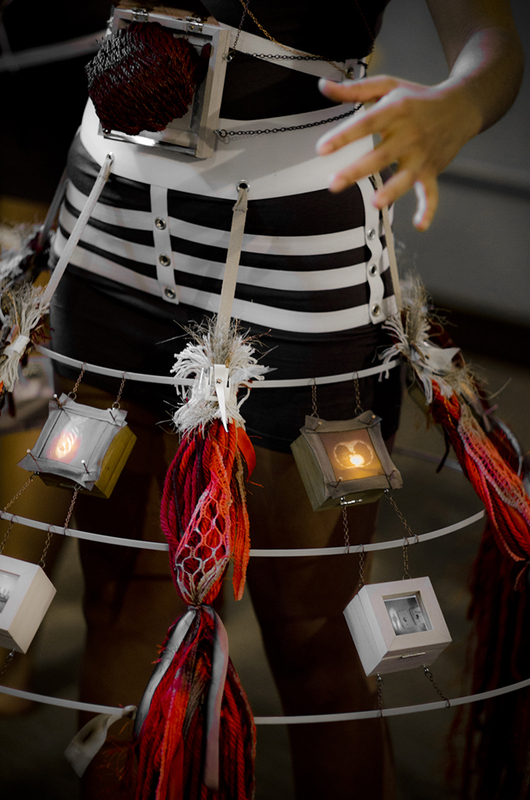 These interactive wearable sculptures are made from wood, fabric cyanotype, elastic, grommets, LED lights, found objects, yarn, sheepskin, fabric and velum. 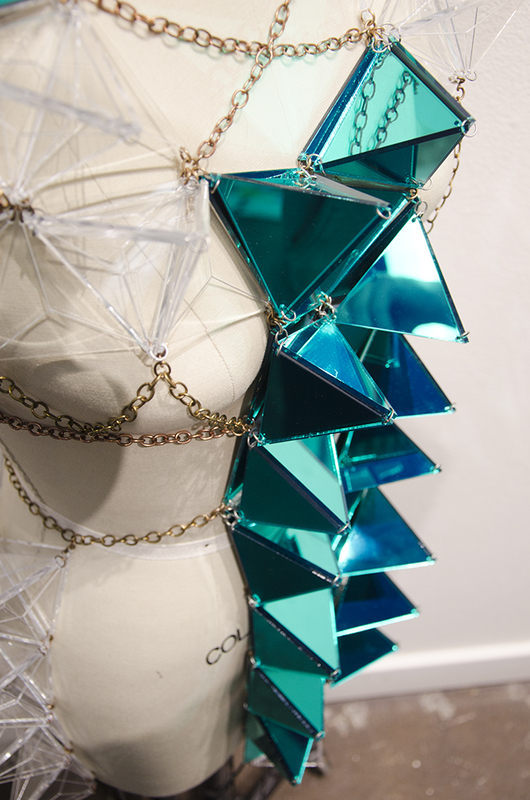 With the wearable sculptures and performance elements I explored how we negotiate space, culturally, and in relation to the natural and built elements of our environment. 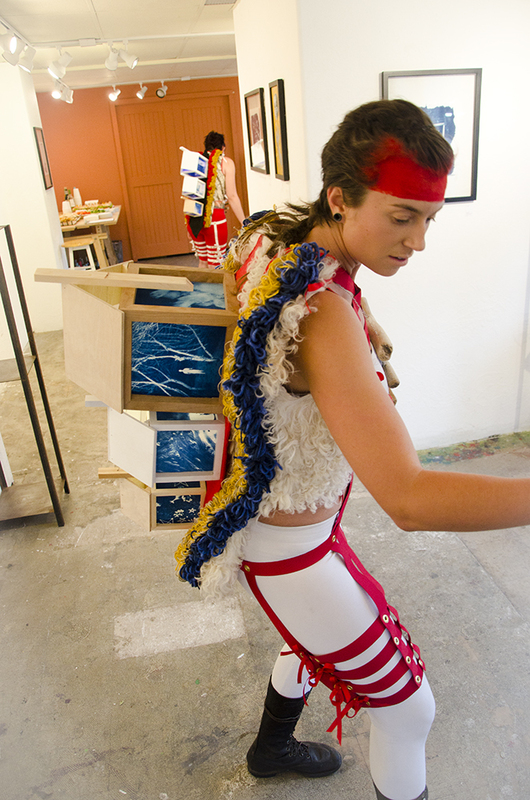 The performance artists are investigating the architecture of their bodies and how they physically relate to the spaces and people around them. Please be in touch via the Contacts page for inquiries about commissioning similar work. 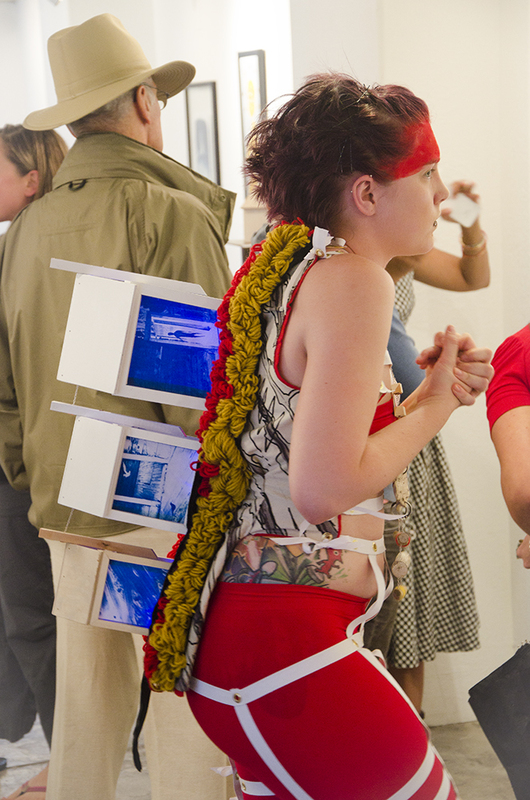 Footage of Minna Jain's solo exhibition "Haunt" in 2014. Taken by Brett Masse. 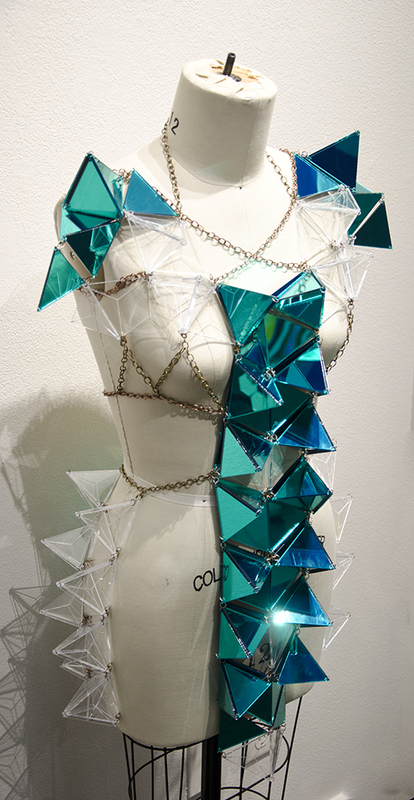 A series of two Interactive wearable sculptures made from laser-cut mirror acrylic glass, chain, rubber, feathers, bones and found objects. 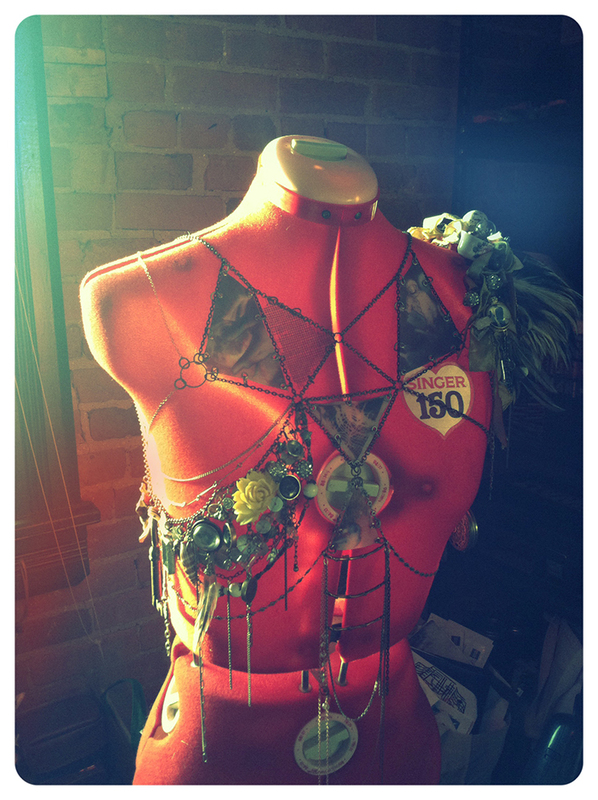 These sculptures were shown as a part of three juried and invitational exhibitions: Down the Rabbit Hole, Durango Arts Center, Durango, CO, Down the Rabbit Hole, Eggman and Walrus Gallery, Santa Fe, NM, and ManneqART Sculpture on the Human Form 2014 Wearable Art Competition, Laurel, MD. 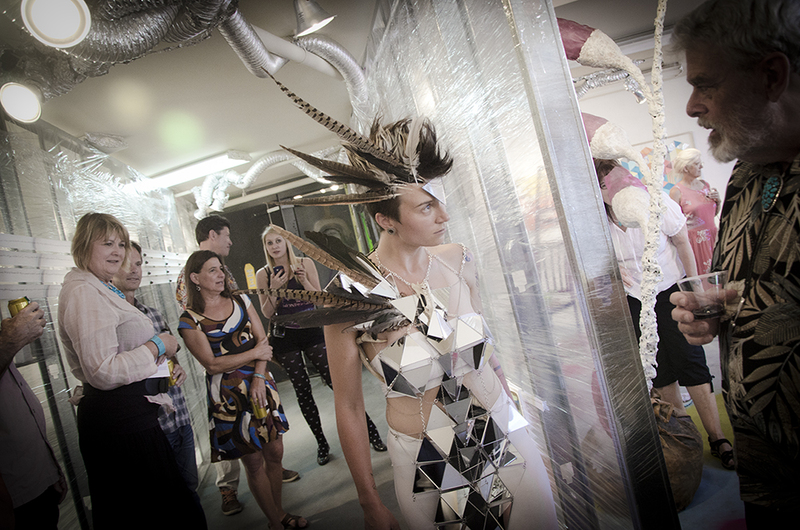 These sculptures and performances explored ideas of self-reflection, self-perception and delusion. Please be in touch via the contacts page to commission similar work. This video was created by Craig Clark during the Santa Fe exhibition of Down the Rabbit Hole at Eggman and Walrus Gallery in 2014. 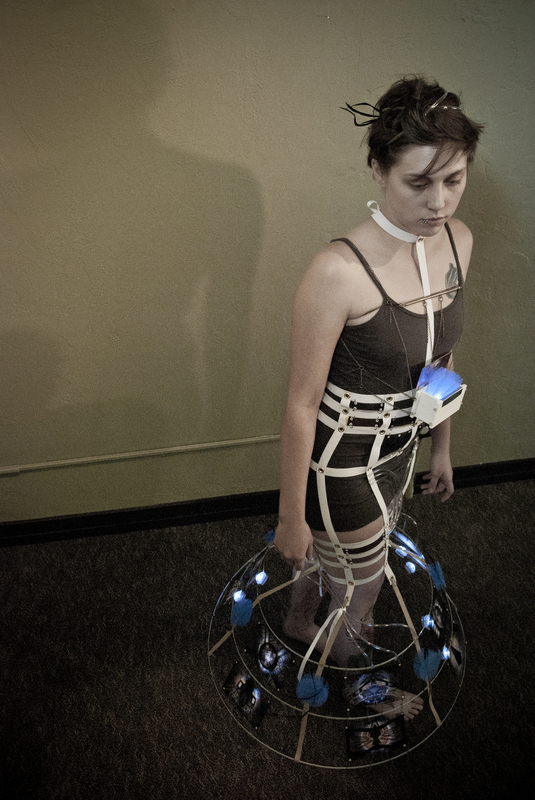 A series of four Interactive wearable sculptures and performance installation. 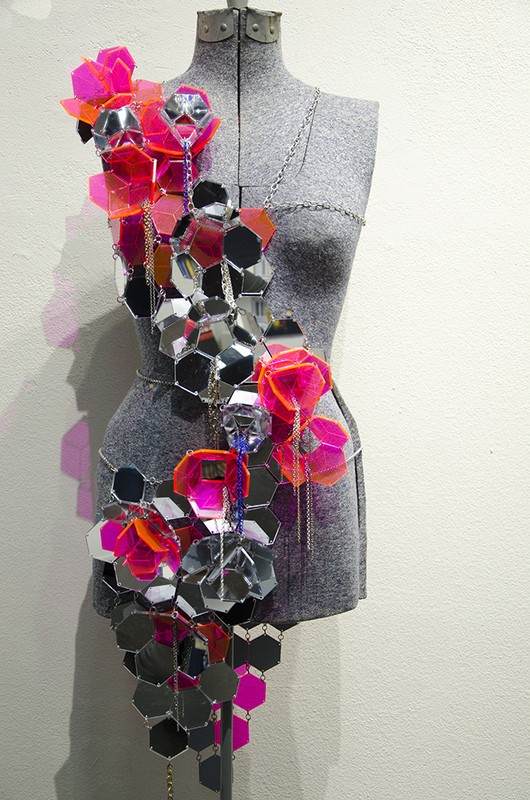 Sculptures are made from alternative process photographic elements, elastic, fiber, LED lights, chain and found objects. 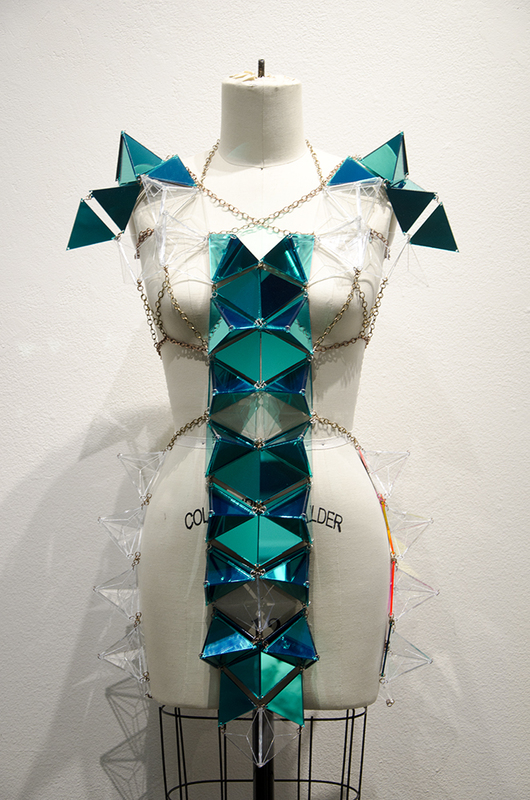 These sculptures were shown as a part of the 2013 Studio & Gallery Group Show, a juried exhibition juried by Studio & Gallery. 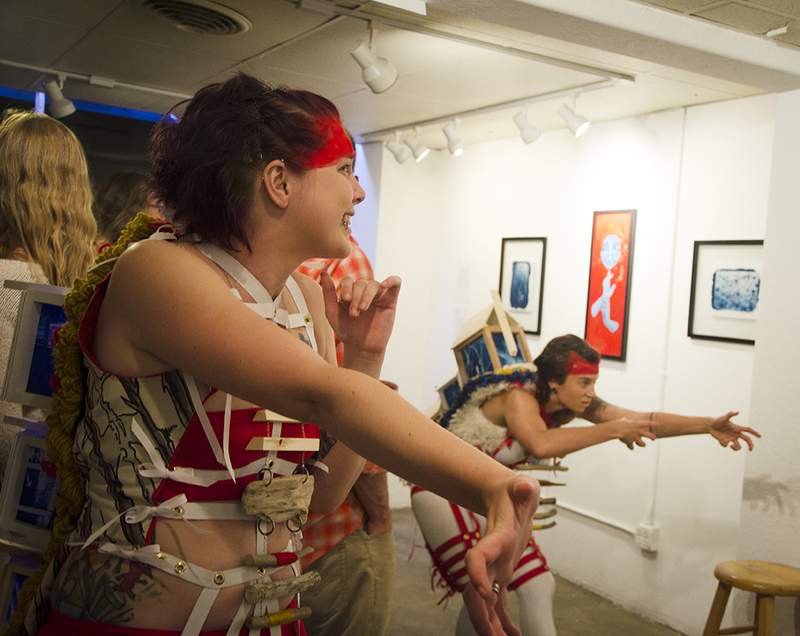 These sculptures and performance installation explored the concept of bringing internal emotional processes to the surface in order to shed and heal. 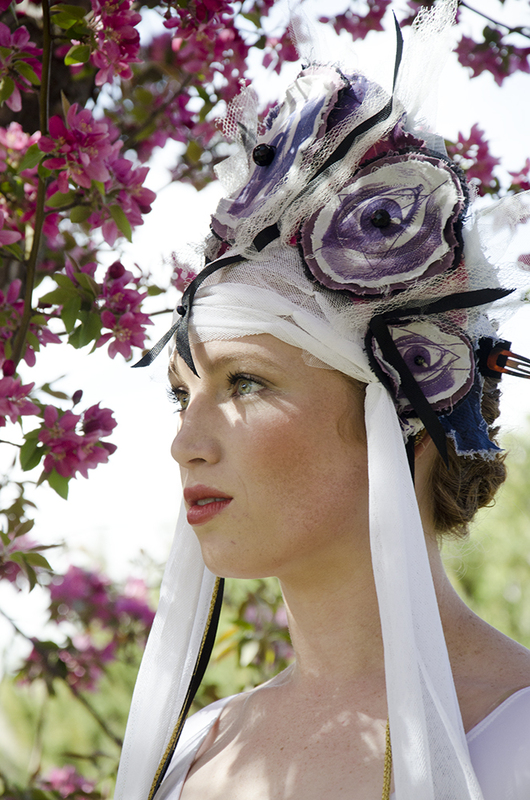 Clip from "Sea Change" which included 4 wearable sculptures on models, alternative photography, and a piece of music titled "Hear Me" by Dark Dark Dark. Video taken by Minna Jain.